One of the most famous Georgian garden squares in Dublin, Mountjoy Square is located less than a kilometre North of the River Liffey. One of five Georgian squares in Dublin, whilst Merrion and Fitzwilliam on the south side may be more ‘touristy’, Mountjoy Square is livelier and with a rich literary and architectural heritage. One interesting fact about Mountjoy Square: it’s the only Georgian Square in Dublin that is truly square, with each side being exactly 140 metres long. Initially planned and developed by the 1st Viscount Mountjoy, Luka Gardiner, construction began in the 1790s until official completion in 1818. Terraced Georgian houses built in distinctive red brick surround all side of Mountjoy Square. Mountjoy Square was considered to be one of the finest residential squares in Europe, according to the secretary of the Mountjoy Square Society, Karin O’Flanagan. Sadly some properties fell into ruin in the 20th century and were demolished and replaced by sympathetic reproduction facades to maintain the Georgian feel. With urban renewal tax incentives, new redevelopments of flats and other properties are bringing new life into Mountjoy Square. Perhaps the outstanding feature of Mountjoy Square is its Neoclassical plasterwork, which the architecture critic Christine Casey claim in 2005 is “finer even that that found in the contemporary terraces on the south side of Merrion Square”. On 14th May 2012, Mountjoy Square was established as an Architectural Conservation Area, which protects the entire area by needing Planning Authority permission for any works on any building. The original granite paving stones are still noticeable in Mountjoy Square, especially around the south-west corner. Although concrete has replaced some areas, the original granite paving still maintains the nostalgic feel of the Square. On closer inspection of the buildings, the original coal holes and cast iron covers can be seen in most cases. The street lamps of Mountjoy Square are of two distinct types, the outer sides having elegant Scotch Standard lamp (from between 1903 to 1920) posts whilst the inner (park) side has a more modern design from around the 1940s. Perhaps the earliest of many famous residents of Mountjoy Square was Arthur Guinness, founder of the Guinness Brewery and philanthropist. Arthur’s son Desmond attempted to restore the character of the square, along with Irish Georgian Society, between 1966 and 1975. 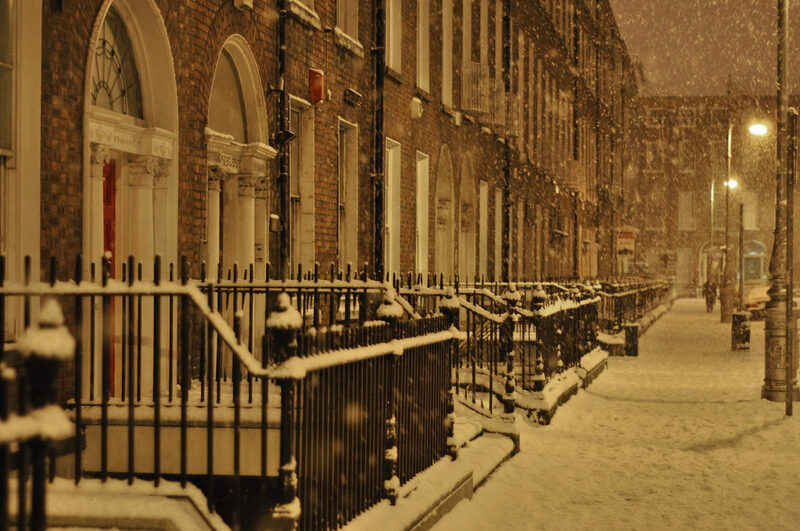 James Joyce, one of Dublin’s most celebrated literary figures, lived around Mountjoy Square in his formative years. Joyce’s works such as Dubliners, Finnegans Wake and Ulysses refer to areas around Mountjoy Square. The Irish playwright Sean O’Casey lived at no 35 Mountjoy Square during the Irish War of Independence. O’Casey set his Dublin Trilogy (The Shadow of a Gunman – Juno and the Paycock – The Plough and the Stars) around Georgian Dublin, especially Mountjoy Square. John O’Leary, poet and editor of ‘The Irish People’ lived at 53 Mountjoy Square, and W.B. Yeats was also known to have stayed there. Before the establishment of the Irish Free State, Dail Eireann – the Parliament of Ireland – used to meet in the Mountjoy Square home of Walter J. Cole. Famous politicians who have lived in Mountjoy Square include Sir Robert Anderson, Richard Dowse, Joseph Napier and James Whiteside. Famous artists such as the stuccadore Michael Stapleton, Charles Thorp, Thomas Farrell, Paidraig O’Faolain have also lived on Mountjoy Square. Stapleton built three houses there, later moving to Mountjoy Place in the South East corner of the Square. Mountjoy Square, mainly due to links with Sean O’Casey and the rise of Irish Republicanism, features heavily in Dublin and Irish history. As the British authorities considered Dail Eireann a dangerous organisation, Mountjoy Square was home to many clandestine meetings and rallies, not least around the time of the Easter Rising. Dublin’s famed rock band U2 used to rehearse in a flat on Mountjoy Square in the late 1970s, and archival photographs reflect this heritage. Joe Duffy, the Irish Radio Presenter, journalist and activist was born on Mountjoy Square in 1956. Mountjoy Square can also claim an Academy Award win. The 2007 movie Once won an Oscar for best original song, and was filmed in an apartment on Mountjoy Square East. TV mini-series such as Prosperity were also filmed around Mountjoy Square Park. Mountjoy Square is one of the most northerly stations of the Dublin Bikes bike sharing system, and also had a pay-as-you-go car hire scheme called “The Go Car” on Mountjoy Square West. Mountjoy Square is well-served by the Dublin Bus, and has termini at the north side of the square. Links to the airport, south side of the city and other hop-on, hop-off buses can be found around the square. From its beginning as a Georgian square, through its literary and political connections, through to modern day movies and artists, Mountjoy Square continues to play a large part in Dublin’s history, architecture, community and culture. With an increasing focus on residential development and excellent transport links, Mountjoy Square is still as vibrant as ever and looks to continue its heritage and significance for years to come. So the next time anyone tries to tell you that any of the other four Georgian Dublin squares is the best, ask them if they can match Mountjoy Square on any of the above! Mountjoy Square, Dublin, Proudly powered by WordPress.